Amber & Brendan are Fun In The Sun Weddings’ newest newlyweds! This adorable bride and groom have happy little coincidences running through their relationship, evidence that they are truly ‘meant to be’. Amber & Brendan met at a bar in Chicago. She made the first move by throwing him a thumbs up across the room, and after he approached her, they danced the night away. They decided to share a taxi at the end of the night, only to discover that they were neighbors on the same street! They had their first date the following week and got serious immediately. Brendan proposed on the beach in Cancun at Finest Playa Mujeres, the resort they would later be married at. They chose a destination wedding in Cancun because they loved the idea of getting married on the beach in a warm location. Having been to a destination wedding in Mexico before, they loved that their wedding party and wedding guests could get to know each other really well through vacationing together. They had parties every day at the pool and bars throughout the resort, with their favorite group of people. Amber & Brendan got married on the beach in the same location where they got engaged, and although it was unplanned, their wedding day also turned out to be the four-year anniversary of the fateful night they met at that bar in Chicago. The bride and groom got rain on their wedding day and almost didn’t get married on the beach! But they stood their ground and kept it all outside. It was so windy that her veil almost fell out during the ceremony, and right after their I Do’s it down-poured while taking photos on the beach, forcing them into a men’s washroom for fifteen minutes to stay dry! Amber was still a stunner with hair and makeup by Mindy City Hair. And on the bright side, their guests had a nice breeze keeping them cool during the late night dancing at the wedding reception. Amber wanted a simple beach wedding dress, without frills, lace or beading. Her dress was the first she tried on, and after looking at others she came back to it because it fit like a glove. Their wedding style was Classic Beach Glam. Foral and decor by Alquimia Events included shades of pinks to compliment the backdrop of green palm trees and blue ocean. Pops of gold and details in a very pale teal color. None of the colors were too harsh or bright and were intended to complement their natural surroundings. For fun, they also had a running tropical theme of pineapples and flamingos accents throughout they wedding week as well. The bridesmaids wore different dresses in shades of pink because Amber wanted them each to feel beautiful in their own dress they picked out. And the groomsmen went free of socks and ties to keep the beach vibe going. Everyone in the wedding party was a family member, and Amber’s cousin Rob was the wedding officiant. We loved that the people standing by us would be there forever. One piece of advice that Amber has for the brides-to-be out there is to think about your guests, not just yourself and bridal party. A few touches to make your guests comfortable and happy will go a long way. At their reception were DIY baskets full of Flip Flops for dancing and Pashmina Wraps in case guests got cold at the reception. Both were a big hit! What other advice can she offer? Tradition can be left in the past… create a wedding that works for the both of you and try not to get bogged down by old traditions and expectations. Make it unique. So many weddings are cookie-cutter, find a thing or two that you can make your own. I’m glad I chose a few unique touches that guests will remember forever! Remember your wedding day is meant to be fun, but it is fleeting! Soak in every moment of the day and don’t bother yourself with stress, it’s just not worth it! Amber and Brendan, it has been such a pleasure to work with you, and we wish you every happiness in this next chapter of your lives together. Congratulations! And if you are looking for the best Cancun wedding photographers for your beach wedding, contact us today. We are Fun in the Sun Weddings, the best wedding photographers in Riviera Maya, Mexico. Want to know more about Finest Playa Mujeres? Read unbiased reviews on Tripadvisor here. 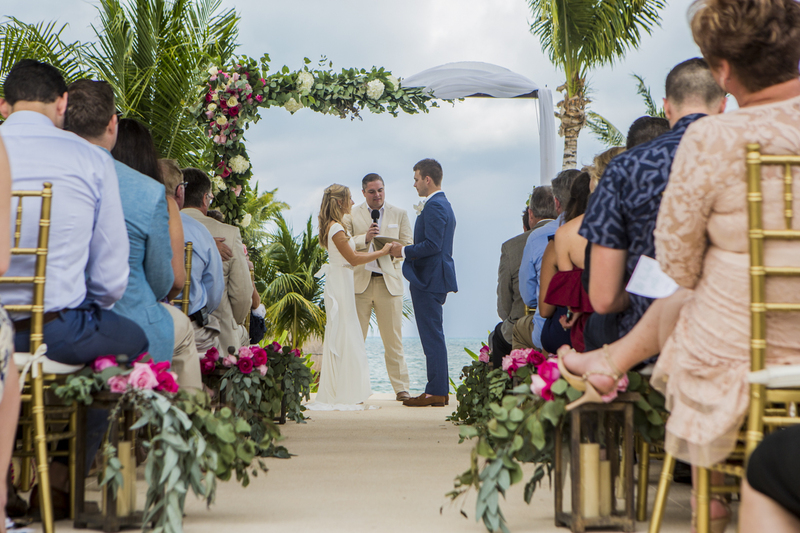 Download our FREE Ultimate Guide To Getting Married In The Riviera Maya NOW! We used Fun In The Sun Weddings for photography at our beach wedding at Finest Playa Mujeres in Cancun. We did the Sandy Toes package + an extra hour and it was perfect. Marc was such fun to work with, he's casual but professional and immediately made us all feel comfortable. He already knew the best photo ops at the resort and we loved his photography direction! Marc and his wife Gillian are quick to respond and were both very helpful during the planning process. They ask the right questions to understand your style and preference upfront which I really appreciated. I highly recommend using them for a wedding in the Cancun area! Fun In The Sun Weddings is a destination wedding photography company shooting on the sunny shores of Playa del Carmen, Mexico. We specialize in professional wedding photography on the tropical beaches of Cancun to Tulum, and all points in between along the beautiful Riviera Maya. Get insider information, advice and tips for planning your wedding from destination wedding expert Gillian Andrew. Thank You! The guide is on it's way to your email! Your information is safe with us. We hate spam.